This article addresses the question of why Forest Lodge is included in the Glebe Society’s area of operation. The residents of Glebe and Forest Lodge now share the use of many commercial and public facilities. The current suburb boundary between them could be considered an administrative abstraction. This article takes a more historical approach, concluding that the history of the two suburbs is also at odds with the current suburban boundary between them. Since geography is important here, it is appropriate to start with the Glebe Society’s boundaries, as set out in its Constitution. The oldest dated copy, from 1978, states that the Society’s area, ‘Glebe’, ‘shall be taken to embrace the areas bounded by Wattle Streer (sic), the Harbour, Johnston’s Creek and Parramatta Rd.1 The current Constitution uses more formal language but the same boundaries, which clearly do include the modern suburb of Forest Lodge. There is no obvious historical explanation for including either parcel of land. For instance, both were outside the boundaries of the Municipality of Glebe, proclaimed in 1859. Perhaps some early Glebe Society members may remember the original discussions on the boundaries? Forest Lodge takes its name from the villa Ambrose Foss built in the Glebe (c1836), on a parcel of land near the corner of the current Bridge Rd and Ross St that he acquired from J. Williams. After building his villa, Foss set about building an estate to complement it. He likely acquired small parcels to the west and north of his villa, but his main acquisition is thought to have been an 1840 grant of 31 acres, stretching from his villa grounds to Orphan School Creek and the Parramatta Rd. The result was a vast woodland estate of about 40 acres, with Foss’ villa near the north eastern corner of his estate. However, in the face of deteriorating economic conditions and recurring insolvency from 1857, successive new owners of the Forest Lodge Estate struggled to capitalise on the benefits of the new road. 7 Finally, at the end of 1862, the bulk of the Estate (excluding the Forest Lodge villa and its immediate surrounds) was placed on the market in villa-sized lots, targeting a relatively narrow set of potential buyers – gentleman looking for a semi-rural location close to the city.8 Some lots in prime locations sold, but much of the Estate did not. 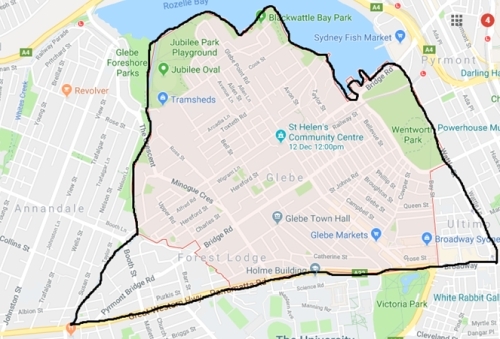 Glebe’s emerging property developer par excellence, G. W. Allen, along with three fellow politicians, stepped in, buying the residual land along with some adjoining land. They undoubtedly cleared at least some of this land, laid out access roads, and devised their subdivision plan, which included many smaller lots. When they started selling lots in 1865, the Forest Lodge Estate developed rapidly, with many land buyers further subdividing as the Estate gained in popularity. The Forest Lodge Estate’s proximity to Glebe had initially been a selling point but, as Solling and Randerson explain, the Estate quickly became a relatively self-sufficient community with its own shops, pubs, churches, schools, workshops such as blacksmiths and, more gradually, larger employers. Ross St became its main transit corridor to the city with an omnibus service and, from the early 1880s, a tram service. The Forest Lodge Estate was a very socio-economically diverse area, as indicated by the mix of housing ranging from very small to very large. In this it was not alone – for instance, after the Lyndhurst estate was subdivided, it also became a relatively diverse precinct. The key difference was the size of the Forest Lodge Estate development which gave it the critical mass to also become relatively self-contained. The Forest Lodge Estate remained linked to Glebe through its inclusion in the Municipality of Glebe, proclaimed in 1859. The Council initially comprised three wards: Inner Ward (the area north of the Pyrmont Bridge Company’s new road), Outer Ward (Bishopsgate, and part of the St Phillip’s estate), and Bishopsthorpe which was an area bounded by the Pyrmont Bridge Company’s Road and Mitchell St, plus the yet to be developed Bishopsthorpe and Forest Lodge Estates. When those estates were developed from the mid-1860s, the complaints abounded, with some new Forest Lodge land owners complaining they could not even build their homes because of impassable roads. The outcome, in 1871, was a new Forest Lodge Ward. Curiously, this ward contained a segment of the Bishopthorpe estate, but otherwise it was relatively true to name – it contained most of the Forest Lodge Estate. However, the use of the term Forest Lodge as a locality descriptor soon began to spread north and north-west, well beyond the Pyrmont Bridge Rd ward boundary. To the north, a key indicator of the spread of Forest Lodge as a locality was M. Hegarty’s 1876 sale of seven allotments adjoining York’s ‘newly erected mansions’ on Pyrmont Bridge Rd. Hegarty simply gave the address of these properties as Forest Lodge.9 Soon after, the Catholic Church created the Parish of Forest Lodge, with a new church and school in Woolley St, entrenching the northern spread of Forest Lodge as a locality. 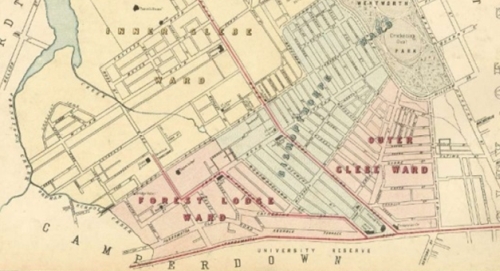 By then, the north-west spread of Forest Lodge had also begun along Hereford St and Ross St. For instance, in 1874, when a dwelling in Hereford St was offered for sale, near the home of Michael Chapman (Councillor and, per force, member for Inner Ward), the location was simply given as Forest Lodge.10 The executors of estates were more cautious though. When the executors of John Wood’s estate subdivided an 8 acre parcel and offered villa and building lots for sale in 1876, the location was described as Forest Lodge, Glebe Heights.11 Similarly, after G. W. Allen died in 1885, his executors subdivided the south-western portion of the Toxteth Park Estate (the area from Harold Park to Orphan School Creek), identifying the locality as Glebe Point. But private vendors and residents in the area adopted the name Forest Lodge more rapidly.12 Within 20 years, the Forest Lodge locality had become much larger than the Forest Lodge Estate or the Forest Lodge ward. 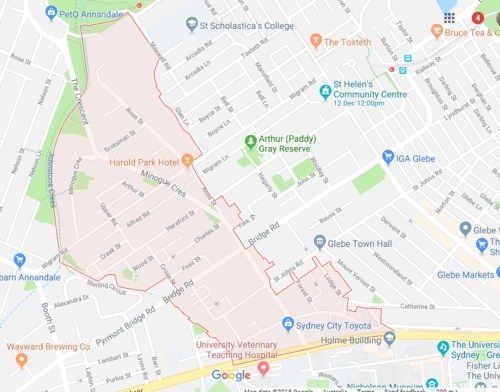 The boundary currently separating the modern suburbs of Forest Lodge and Glebe lies for the most part along Ross St, with detours to encompass, within Forest Lodge, the Harold Park site at one end, and Forest St and Lodge St plus adjoining sections of Arundel St and Catherine St at the other end. These suburb boundaries clearly truncate the ward of Forest Lodge, and the locality of Forest Lodge. Streets, homes and public buildings that were in the Forest Lodge locality or ward in the nineteenth century are now on the Glebe side of the boundary – the Glebe Town Hall, the York houses, and the site of the Forest Lodge villa are prominent examples but there are also a host of smaller dwellings. The modern suburbs of Glebe and Forest Lodge literally share much terrain. They also have a shared history. Forest Lodge originated in the subdivision of a large Glebe estate, through the agency of Glebe’s prime property developer, G. W. Allen. And the south-western section of the Allen family’s own estate also became part of Forest Lodge. This shared land and shared history, to my mind, are important to any explanation of why Forest Lodge is an integral part of the Glebe Society’s domain. 3. ‘The Forest Lodge allotments on the Parramatta Road adjoining the Archdeaconry and near the city boundary’, 1845, State Library of NSW, Mitchell Map Collection, Z/M2811.1823.1845/1. 4. SMH 13 Oct., 1859, p.8. 5. SMH, 12 Jan., 1859, Advertising p. 7. 6. SMH, 12 Jan., 1859, Advertising p. 7. 7. In 1857, a consortium of owners was impeded by the insolvency, and subsequent death, of one of their number. The court-appointed trustees tried on at least two occasions to sell a part share of the Estate, and the mortgage secured by it; they may also have sold individual parcels of land, but other parcels were recorded as in the hands of the Trustees of the Forest Lodge Estate in the first Glebe Municipal Rate Book for 1859. Eventually, it seems David Jones purchased the residual land and debts, but the Insolvency Court also placed his assets in the hands of trustees who ordered the sale of the mortgage secured on the Forest Lodge Estate in 1861. See SMH, 12 Jan., 1859 Advertising p. 9, and The Empire, 2 May, 1857, Commercial Record p. 4, and 4 Mar, 1861, Advertising. p.7. 8. SMH, 8 Nov., 1862, Advertising p. 9. 9. SMH, 12 May, 1876, Advertising p.11. 10. SMH, 7 Dec., 1874, Advertising p.9. 11. SMH, 16 Dec., 1876, Advertising, p. 14. 12. See the sale brochure at https://www.glebesociety.org.au/the-glebe-society/how-to-research-your-house/ ; for the later sale of Ollerton House, see SMH, 19 Aug., 1889, Advertising, p.8.